Yesterday evening we had fajitas, (cue moaning from teen that everyone in the country know what we bloody well had for tea). Sadly the readership of Mintcustard is little more exclusive than that, but she has a point. I am not a particular fan of ketchup and bought salsas seem to have that faintly ketchupy tang to them. They are also full of thickeners, sugars and preservatives. 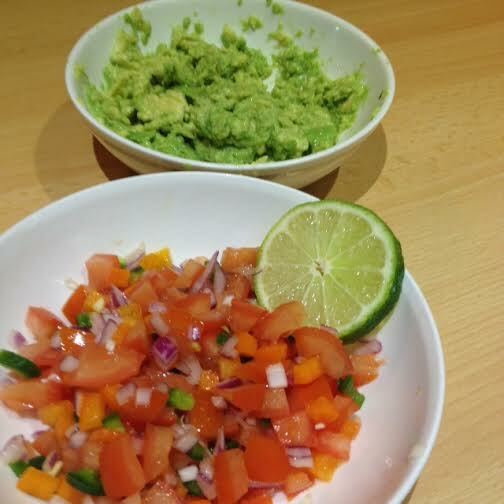 A home made salsa zings with freshness, uses up odds and sods in the fridge so is pretty frugal and can be scooped up with tortillas or flatbreads for an almost instant starter or light lunch too. Paired with a bowl of home made guacamole you really can’t go wrong. In Texas this is served as Pico de Gallo – beak of the cockeral. It can give you a real peck if you add enough chilli, but then it’s up to you how hot you make your salsa. This isn’t really a recipe either, more guidelines and suggestions. The resulting salsa depends on your likes, dislikes and what you have in the fridge! Combine the ingredients together with a good pinch of salt and plenty of lime juice. Allow to sit for a short while to allow the flavours to relax into each other. Serve with fajitas, tortillas or tortilla chips. Please don’t buy a tub of guacamole, a ripe avocado, some salt and a squeeze of lime juice is all you need. Halve the avocado, remove the stone and scoop ot the flesh. pop the flesh into a bowl, add a pinch of salt and a squeeze of lime juice. Mash with a fork until you have the consistency you prefer. Freestyle as you wish, add a splash of tequilla, sprinkle with chopped chilli or loosen with a litle sour cream. Up to you. Again, indulge yourself at every opportunity!